Some people find it easy to concentrate on something that is important to them, while others can have a hard time focusing on just one thing. There are many reasons why someone could have trouble concentrating, sometimes it is related to your personality type. 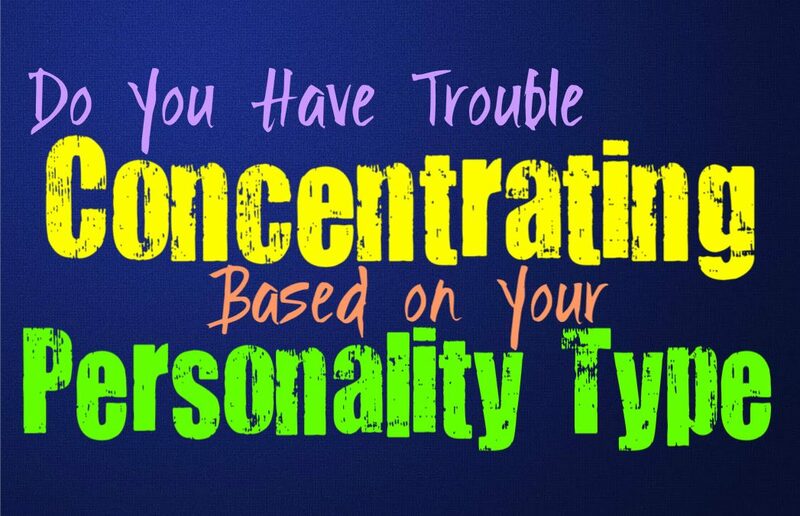 Here is how much trouble you have concentrating, based on your personality type. INFJs can sometimes struggle to concentrate on something when their minds are taking them elsewhere. They do however, have an ability to handle mundane tasks while they allow their minds to go elsewhere. INFJs can concentrate when something is important to them and will do their best to get things done. They are capable of being focused for a while, and can try to avoid letting their thoughts keep them from taking care of things. After a while it does become draining, but the INFJ can often find a way to concentrate when they have to. ENFJs are actually rather focused people, and so concentration isn’t always a challenge for them. They do whatever they can to take care of the things that are important to them, and don’t like allowing their minds to distract them. ENFJs do have very rich inner minds, but they can often find a way to remain focused regardless of that pull. This is why ENFJs do often need time alone, so that they can dive into their own thoughts without feeling guilty about it. ENFJs are good at concentrating when something matters to them, and this often helps them be good multi-taskers. INFPs can have trouble concentrating on some things, since their minds can take them elsewhere. They have a hard time remaining focused on something that bores them or doesn’t really provide them with value. INFPs can become distracted by things outside of what they are doing, and this causes them to lose their concentration. For the INFP concentration means forgoing their inner thoughts and feelings, and this isn’t always something they are prepared to handle. They can concentrate on the things that deeply matter to them, like their loved ones for example. ENFPs can actually lose their concentration with some things, especially if they are bored or distracted. When they are doing something they actually care about then they can often remain focused and concentrate on what is in front of them. Oftentimes the ENFP finds it hard to concentrate on just one thing, since their minds can pull them in so many different directions. They enjoy exploring new things and so it can be hard for them to concentrate on something that doesn’t really inspire or excite them. INTJs are definitely good at concentrating on things, especially the things that are most important to them. They do have rich inner minds and thoughts, but that doesn’t mean they can’t stay on course. When the INTJ is focusing on something that is important, they will do their best to keep their concentration. INTJs are often good at using that rich inner mind to keep them on the path that they need to be on, instead of allowing it to distract them in a negative way. ENTJs are good at concentrating, especially when there is something they need to get done. They are driven people who don’t want anything to stand in their way or prevent them from being efficient. ENTJs value efficiency very much, and so they wouldn’t want their concentration to falter and cause them to make mistakes. They do their best to remain focused and never lose that concentration, especially with the things that they value most. ENTJs do have rich inner minds, which they enjoy exploring in their free time, but that doesn’t mean they allow this to break their concentration. INTPs do sometimes have trouble concentration, since their minds drag them in so many different directions. They might try to concentrate on one thing, but their thoughts become so overwhelmed with new ideas that they become distracted. INTPs try to concentrate on some things, but they just can’t seem to focus if it isn’t rewarding or interesting enough. Their minds are just so filled with new thoughts that INTPs can’t seem to stick to something that can’t quite hold their interest. ENTPs can have some trouble with their concentration, since their minds can go off in so many different directions. ENTPs can have trouble standing still, they simply find themselves becoming bored far too easily. They want to be able to explore new things and ideas, and so they can find themselves losing concentration from time to time. ENTPs can remain focused on something that is exciting and challenging, but once they become bored their minds can veer off in different directions. ISTJs are often great at keeping their concentration, especially with the things they value. They are hardworking and focused people, who do their best to get things done. They are also capable of concentrating when it comes to their loved ones, and will do their best to focus on them. ISTJs simply don’t like becoming distracted from the things that matter most to them. ISTJs don’t lose their concentration easily, and are often good at remaining on course. ESTJs don’t usually lose their concentration easily, instead they are often good at remaining focused. They don’t like allowing things to pull them away from what is important to them. ESTJs value efficiency very much, and so they don’t like losing their concentration. Anything that might hold them back from getting things done properly, is not something the ESTJ is going to let happen. They do their best to work hard and maintain their focus, wanting to stay on course. ISFJs don’t usually lose their concentration, especially when it comes to things they value. They do their best to get things done and take care of their loved ones. ISFJs don’t want anything to keep them from taking care of others and so they try not to let themselves get too distracted. For the ISFJ concentration is important in order to make sure they can juggle and get many things done. They do have some moments where they can become a bit overwhelmed by everything, and in those moments they do have some trouble concentration. Most of the time ESFJs don’t struggle to lose their concentration, instead they are good at remaining focused. They do their best to get things done and take care of their loved ones. ESFJs often take on a lot all at once, and want to do everything they can to provide for others and take care of what matters most to them. There are some moments where the ESFJ does feel a bit overwhelmed, and when this happens their thoughts can become overwhelmed and cause them to lose concentration. ISTPs can sometimes struggle to concentrate, especially on something that is boring them. They like to feel free to explore new things and so sometimes they can become distracted by something more entertaining. ISTPs live in the moment and find themselves wanting to get caught up in the things that excite them most. Their concentration can become lost when they find themselves bored by what they are dealing with. ESTPs can sometimes lose concentration when their minds take them off into a different direction. They can become bored easily by some situations, and so they become distracted by things that are more rewarding. ESTPs simply don’t like staying stagnant and sometimes having to concentrate on things can make them feel this way. When it is something that is challenging and fulfilling, the ESTP will do their best to keep their concentration, even though some things can pull them away for a moment. ISFPs do have trouble with concentration sometimes, especially with the things that bore them. They don’t like having to focus on anything that doesn’t truly fulfill them. ISFPs enjoy diving into new things and want to feel thrilled by their experiences. They enjoy living in the present and want to follow their hearts down whatever path it might lead. Sometimes this causes the ISFP to lose concentration, especially on the things that don’t really keep their attention in the right way. ESFPs definitely struggle with concentration issues, since their minds run around in different directions. Their conversations can even express this, since they often bounce around. ESFPs simply don’t like being bored and so they find themselves drawn to whatever excites them the most. If they aren’t feeling truly fulfilled in the moment they might drift off in a different direction. ESFPs definitely have trouble with concentration, and can find themselves losing focus on something simply because their minds are drawn elsewhere.